Tinned tomatillos fall into my MoFo category of things I requested in a parcel swap from the US and then took forever to use. I can’t buy fresh tomatillos so I think I must have wanted them to stand in for fresh in a recipe. However, once I’d got them I wasn’t sure how well they’d work and didn’t know how to convert them for fresh. My MoFo project forced me to get them out of the cupboard and get them used, so when Matthew requested something spicy for tea I decided to make the chickpea and potato enchiladas from Viva Vegan. It was actually very easy to convert the tinned version for this recipe; I just drained the tin and used them straight in the sauce and ignored the instructions for preparing the fresh ones. 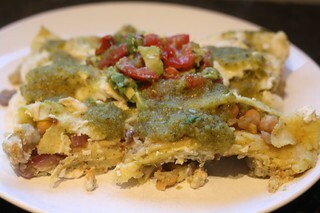 These enchiladas were absolutely delicious. The pine nut creme on the top is so rich that it provides a perfect counterpoint to the sharp spicy tomatillo sauce, and the potato and chickpea filling is a comforting backdrop to it all. 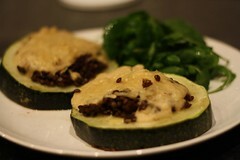 I think I like them even more than the kale enchiladas from Veganomicon which I’ve made plenty of times. 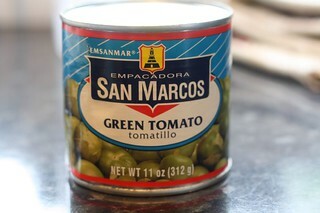 Have you used tinned tomatillos? What did you use them for? Now that I’ve used them, I’ll definitely be ordering them online and they won’t be in my cupboard for as long this time!